... in Nuremburg becomes once again accessible to the public! With the opening of the new galleries, one of the preeminent medieval collections in Europe becomes once again accessible to the public. The new presentation focuses on the art and culture of the German-speaking world from the early Middle Ages to the beginning of the 15th century. This epoch is one of the core collecting areas of the Germanisches Nationalmuseum. Beginning with treasury art and early medieval bronzes and ranging from sculpture in wood and stone to stained glass, earliest panel paintings and precious textiles, a wide array of exceptional works are coherently brought together in the lucid new presentation. The culture of the early and high Middle Ages unfolds before the eyes of the visitor in a fascinating panorama. Never before has the web of associations between various genres within the medieval cosmos been so vividly apparent. Among the objects should be a few very nice arms and armour related items. Figures! I leave Germany in just a couple of weeks, and now I have to try to cram a trip to Nuremburg into my moving schedule. That helm is very cool! Well, I'm back from Nuremburg! Let me start by saying that there is easily a full day's worth of museum there; maybe two. Unfortunately, I wasn't feeling my best when I woke up this morning, and my stamina gave out after a couple of hours. It was still worth the trip. I didn't really know where I was going at first, but I managed to get out of the Bahnhoff in the right direction, and then found a map. There were also street signs, so I didn't have any trouble making it there. Worse case senario, I could have hopped a cab, but why do that for a 2-3 block walk? The museum is open from 10am to 6pm most days (10-9 on Wednesdays, and closed Mondays), and admission is 5 Euro (4 if you are a student). All of that info can be found in the link that Wolfgang provided, but there it is in plain English, if it helps. The admission counter is discreetly located to your right as you walk in (I almost walked right past it), and directly accross the lobby is an area with lockers for storing your coat, etc. (this is a big plus for me, as I wear a fedora, but try to keep from having it on indoors; the locker meant I didn't have to carry my hat around all day). You have to put one Euro in the lock to get the key to turn, but you get your euro back when you open it back up. The Mittelalter (Medieval) exhibit is apparently still being populated, as there are a couple of empty rooms that you cannot enter. Still, the things that are on display are really nice. 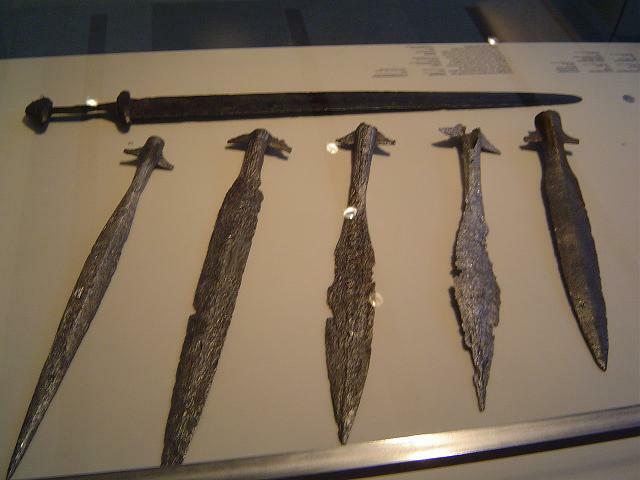 There is a Carolingian sword and several spear heads, as well as an Ulfbert sword with a gold covered guard and pommel. There is also quite a bit of stained glass (one of those things that always gets my attention), as well as lots of textiles and some paintings. Most of these have as their theme, the arrest or crucifiction of Christ, so there is plenty to stimulate the militant mind (including some rather unique boxy, multi-lame bevors). 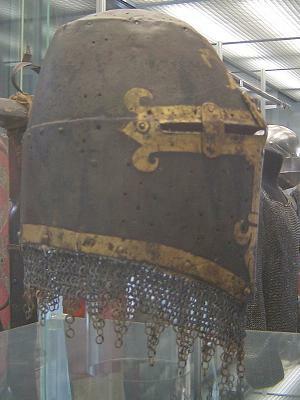 The bulk of the arms and armour can be found by following the blue text signs that read "20 Jahrhundred." They will direct you to a room filled with weapons and sporting arms from the ninth century up to the 19th. One of the pieces that really caught my attention here was a Type XIIa sword in the first display case. I would guess the blade length to be about 37 inches (+/-2"), and it has very acute point that caused me to think it was a Type XVIa at first glance. The pommel also straddles types. It is a Type J, but rather than having the single slope, this pommel tapers in two stages in such a manner that betrays its connection to Type I. The part that I loved was the stars/crosses that run along the outside of the pommel. They add a very regal touch to an already elegent sword. There was also an interesting piece (I would call it a small sword, but the blade was single edged and gently (but deliberately) curved) with an adjustable stirup hilt. 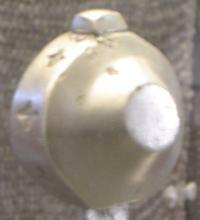 Two bars apparently lock alongside the main stirup, but can be released and are held open with (rather stout looking) springs to form a rudimentary basket hilt. Other rooms within the museum have things such as cabinets, glassware, chairs (including some c.1965 ), and even a large room dedicated soley to musical instruments (no doubt in anticipation of a visit from Chad). I would disagree with the comment that the exhibits are stuffed. There is plenty to see, but none of it really feels crammed together. If any of these rooms is crowded, then so is the British Museum, the Tower of London, the Mainfrankisches Museum, the City of Fort Collins Museum and every other museum I've been in. I had a good time and highly recomend that anyone who has a chance stops by this museum for a visit. I took about 100+ pictures (they do permit non-flash photography) that I will try to get uploaded to the albums, but for now, here are the pieces mentioned above. 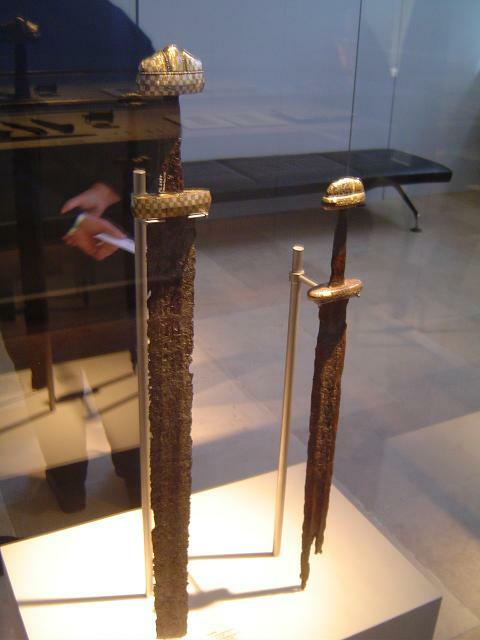 The large one is an Ulfbert sword. Thanks for the pics, Grey. It is not likely that I will be in Nürnberg any time soon. The Ulfbert hilt is beautiful! Are the spearheads in the first picture as huge as they look ? Impressive. That picture is a little distorted, but they are pretty big spears. All of them have blades in the 12" range (my estimation). The black one on the far right has a socket that is 1.5-1.75 inches in diameter. Of course, the one on the far left is only about half an inch. Thx a lot for your report and the pics! Thanks for the great pics. Did you manage to get a look at the helm depicted above? I did see that helm. It is in the same display as the Type XIIa sword I posted. It's pretty neat. Was there something specific you wanted to know, or a picture you wanted to see? Well, I was wondering if you had taken any photos of it. I took several that did not come out, thanks to the glass. This is the only one I ended up keeping. Is that fleur de lis cross painted or gilded directly on the helm? It doesn't look like a separate reinforcing piece. It looked like paint to me. It could possibly be gilding, but I don't think so. It is definately not a seperate piece. The verticle bars over the sights, on the other hand, are separate pieces, and the bottom front plate has a extention that attaches to the top (just like the Pembroke helm).